Not sure why I am calling this a pesto......there is no basil, no garlic, and no cheese. 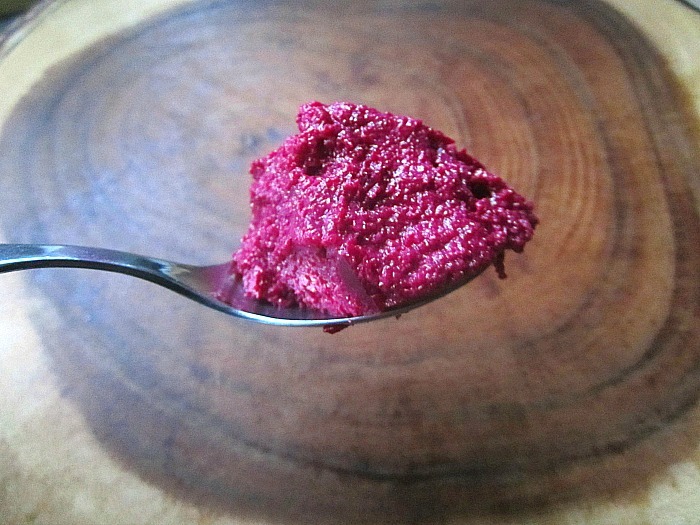 I used to call it "beet hummus" when I added chickpeas and tahini, but not here, not today. This is an updated version and I love it even more. 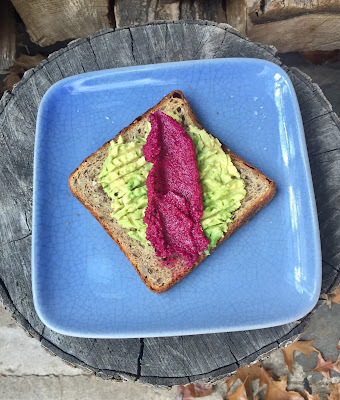 I love it spread on toast with my morning avocado.....with goat cheese and arugula on a pizza......with fresh mozzarella, with yogurt....the possibilities are endless. This is lick the spoon good. I think the key to this recipe is the beets. I have had batches of roasted beets that taste like dirt. Just nothing but earth.....almost a metallic taste in my mouth. I think this is the reason people shy away from beets. 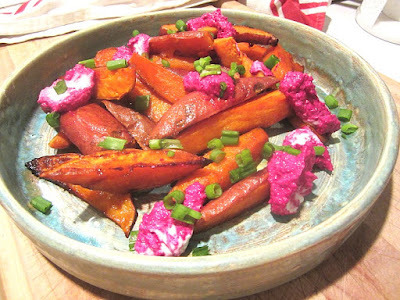 But then, I've made roasted beets that are sweet as candy! (which is usually the case). I adore beets, in any color. Here is the updated recipe. So nice to have a container of this on hand for lunches and snacks. To roast beets: Trim the greens from the beets and place in a foil packet. Drizzle w/ olive oil and kosher salt. Wrap the foil packet tightly. Roast in a 400F oven for 1 hour. Let cool completely, then peel the beets under running water. Cut the beets into dice and place in food processor. Add in lemon juice, toasted walnuts and the rest of the ingredients. Pulse until it becomes a beautiful bright pink puree. Will last in the fridge for a week covered. I loved it swirled into Greek yogurt with some mint leaves for breakfast......trust me, it's delicious (sounds weird, I know). Then save some for Gjelina's delicious roasted yams (sweet potatoes where I live). Cut up some sweets into wedges and lay on a parchment lined baking sheet. Mix up a teaspoon of honey, a few tablespoons of olive oil and some piment d'espelette or smoked paprika (pimenton). Drizzle this mixture over the sweet potato wedges and sprinkle w/ kosher salt. Roast in a 400F oven for about 30 minutes, turning once during the baking time, so all sides get caramelized. Serve with this delicious beet yogurt mixture and chopped scallions on top. Can't wait to try this one....looks like a winner. I finally got beets and sweet potatoes at the store today. I am making this because it sounds delicious but I also want to see these amazing colors sitting on my very own kitchen counter (and in my mouth! ).